The Goo Goo Dolls are back with their Something For the Rest of Us album dropping August 31. As always, we are tuned in to the latest and greatest — and now, SheKnows is proud to premiere the Goo Goo Dolls’ brand new track, Now I Hear! Now I Hear only on SheKnows! This is the only place in the world to hear Johnny Rzeznik and the boys’ powerful track of self realization before the album arrives August 31. Something for the Rest of Us is the Goo Goo Dolls’ ninth studio album. If you have had the Goo Goo Dolls on the brain of late, it’s with good reason: The album’s first single, Home, has been rocking the iTunes and Billboard charts since June. Now I Hear — which you can hear below — is sung by of Goo Goo Dolls’ bassist, Robby Takac (pictured above right) who was also formerly the band’s lead singer. Goo Goo Dolls’ leader Johnny Rzeznik admits that it is with great care that he and the Goos craft their songs. “I wanted some of the material on this album to address the disillusionment of the difficult period we live in — I wanted to give a voice to the emotional uncertainty that accompanies hard times,” Rzeznik said. And speak to them he will: The Goo Goo Dolls have been rocking our world for over two decades, and have so far sold 10 million albums. 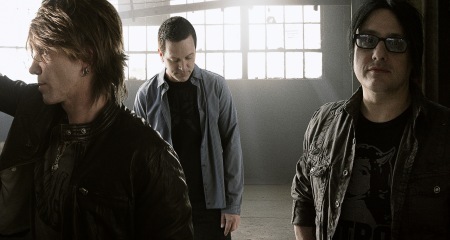 The Goo Goo Dolls have hit the road in support of their new album, and the band is on tour through the end of August 2010. So if you live in the following cities, make sure to get yourself some live Goo!